One of Facebook’s mottos is “Move Fast.” Indeed, there are posters extolling that mind-set throughout the company’s offices. 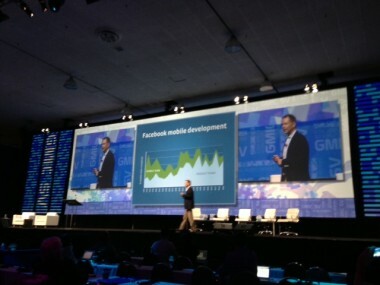 But when it comes to mobile, even Facebook wasn’t moving fast enough. That was the message on Friday from Facebook Mobile VP Vaughan Smith. And yet the opportunity there is huge, Smith said. Falling smartphone prices mean that an ever-increasing number of people around the globe are getting their hands on a device. Moreover, he said, more customers are shifting to plans that allow mobile data access. Historically, Smith said, the company’s goal was to take what it was doing on the Web and copy it as much as possible onto phones. “We’ve completely changed the way we do product development,” Smith said, saying that Facebook is now focused on mobile-first efforts. Most of its mobile code is now coming from the key product teams, rather than from a team trying to “mobilize” existing products. The other key change is putting more energy behind native applications, rather than HTML5 and the mobile Web, Smith said, reiterating a point made recently by CEO Mark Zuckerberg. On the business side, the company is working hard to start selling mobile advertising. There, the company had essentially no revenue in the first quarter of the year, but has moved to put ads into the news feed and other places. Click-through rates, he said, are ten times what they are on the desktop, he said. “Clearly, it is early days with these types of products,” Smith said. Facebook is also helping cellular carriers that partner closely, noting that Facebook users switch carriers 18 percent less than a typical customer.